Monitor Audio Monitor 100 review | What Hi-Fi? It is said that the best way to capture someone’s attention is by stimulating their senses. Although speakers are unlikely to entice you through taste or smell, and aren’t usually soft enough to cuddle, they can make a visual statement in addition to an aural one. We’ve seen pairs with transparent horn designs and those that resemble seahorses and trombones. But the aesthetic ambitions of a £200 speaker are inherently more limited. 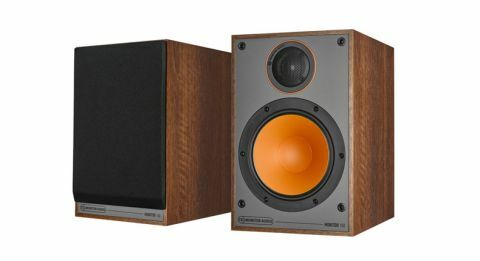 Yet with its new entry-level speaker series, Monitor Audio has found a way to grab you by the eyeballs: orange speaker cones mounted on a grey baffle. It’s a shade of orange perhaps better suited to a pair of football boots than a speaker cone, but it certainly does make a bold impression. But, rather like the footballer in the stand-out boots, the question is: does it have the skills to justify the look? In the case of the range’s larger of two pairs of standmounters, the 100s, the answer is 'yes'. We play The Tallest Man On Earth’s There’s No Leaving Now and it’s clear the 16.5cm MMP II (Metal Matrix Polymer) bass driver and 25mm black C-CAM (Ceramic-Coated Aluminium Magnesium) dome tweeter (derived from the tweeter used in Monitor Audio’s next-level Bronze series) make a good team. The frequencies integrate naturally and cohesively, so when the full width of the piano is deployed in combination with Kristian Matsson‘s wide vocal range, the delivery just works. There’s a stark clarity to his tender, nasal tone, and scale and scope within the open, spacious and room-filling soundstage for it to soar when he’s at his most expressive. Any lingering doubts that a compact, budget-conscious pair of speakers can sound clean and confident at significant volume are put to rest after just a few moments with the Monitor 100s. It’s not the warmest or most refined of deliveries. The vocal has a coating of sun-kissed country twang the Monitor Audios can't quite lay bare, and their somewhat coarse treatment of higher frequencies doesn’t caress the piano harmonics quite as it should. But the 100s’ precise and articulate approach, especially with the midrange, goes some way to compensating for that. The low-end harnesses enough substance and texture for the balance to avoid feeling lightweight, too – as is evident when the thrumming mass of drums and electric guitars in Caspian’s Halls of the Summer comes through the Monitor 100’s driver. And, showing off the speakers’ balanced handling of frequencies, the twinkling synths that cut in above ring through distinctly. A fine sense of drive allows them to go full speed ahead with the tumultuous composition, and that space and scale asserts itself again to keep things easily digestible. A fair degree of dynamic flexibility within its sweeping range saves the track from sounding in any way constrained too. The stumbling block here is Dali's Spektor 2s – more specifically, their tighter handling of rhythms. Perfume Genius’s Just Like Love is an exotic Afrobeat-like array of percussion, keyboards and bass guitar, and the interwoven rhythmic structure of those instruments feels, relatively speaking, haphazard through the Monitor Audios. But while not quite experts in timing, they capture the track’s sprightly nature with a dynamism akin to that of their driver colour. Whether or not you choose to hide the orange cone and grey baffle behind the grilles, the well-built Monitor 100s – available in black, walnut or white finishes – warrant a place where they can be seen as well as heard. While they don’t favour being placed right against the wall (unlike some smaller speakers), giving them too much freedom in a room only highlights their relative lack of warmth and refinement. We’d suggest keeping them around 30cm from a wall for the most agreeable sonic balance. On a practical note, the two sets of binding posts mean they can be bi-wired (connected to an amp via two cables - one for higher frequencies, the other for the lower) or bi-amped. Naming products after the brand name suggests a certain level of confidence, and the Monitor 100s do the company name proud. However, a lack of refinement and outright rhythmic dexterity compared to the competition means they aren’t quite as compelling as the company’s three-time Award-winning Bronze 2 standmounts they sit beneath.